1. The "missing heat" has gone back to space as it always has...via outgoing longwave infrared radiation. 2. And more importantly, the greenhouse effect is not increasing as per IPCC dogma. Thus, Trenberth's "missing heat," which only exists in falsified climate models, is not present in the atmosphere or oceans, and is now past Alpha Centauri located 4.3 light years away, i.e. it's not "in the pipeline" and is never coming back. The analysis supports that of Dr. Noor van Andel, who unfortunately passed away three years ago, finding that IR radiation to space increased over the past 62 years, the exact opposite of the predictions of CAGW theory and computer models. In a post at Australian biologist Jennifer Marohasy's site, spectroscopist and engineer Michael Hammer also comes to the same conclusion finding the last 30 years of NOAA satellite data is incompatible with AGW theory. And the NOAA data plotted below by climate4you.com also demonstrates an increase in outgoing IR radiation over the satellite era. 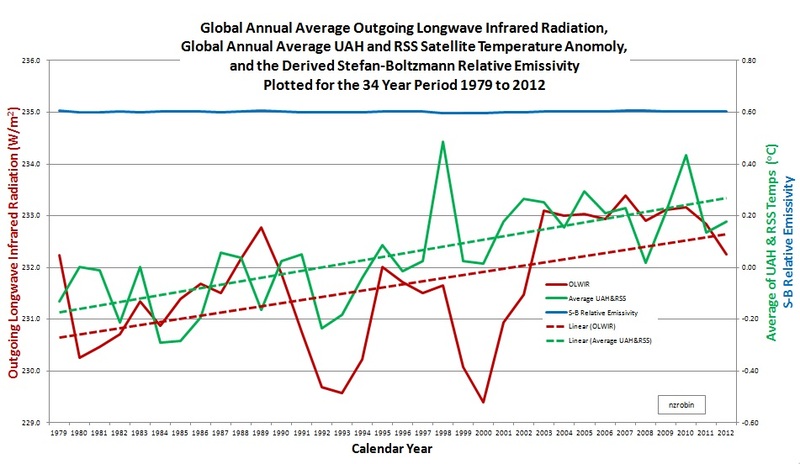 Diagram showing outgoing longwave radiation (OLR) at the top of the atmosphere between 180oW and 179oE (0oE and 359.5oE) and 90oN and 90oS since December 1978 ( red line; National Oceanographic and Atmospheric Administration (NOAA), and the global monthly average lower troposphere temperature (blue line; University of Alabama at Huntsville, USA). The thin lines represent the monthly values, while the thick lines are the simple running 37 month averages, nearly corresponding to running 3 yr averages. The infrared wavelength covered is 10.5-12.5 µm (Gruber and Winston 1978) and covers the main part of the atmospheric infrared window. Last month shown: October 2010 (OLR) and January 2011 (UAH). Last diagram update: 13 February 2011. Click here to download the entire series of NOAA monthly OLR-values since June 1974. Choose first 'OLR' then 'Select field'. Just in case you were not aware, since about 1997 or so, there has been nearly no global temperature rise. This is despite atmospheric CO2 concentration continuing to rise. To date there are some 55 ideas to explain this slowdown in global warming. Some of the ‘explanations’ presume the so-called ‘greenhouse effect’ is operating as the IPCC models calculated; it’s just that the heat has hidden elsewhere, maybe deep in the ocean. I wondered if there was empirical data available of the greenhouse effect? 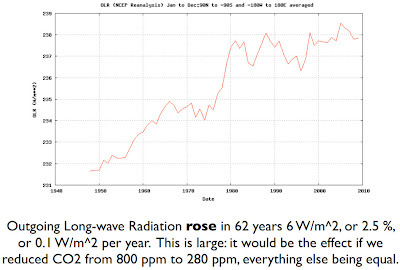 And could it show whether or not the greenhouse effect is increasing with increasing CO2, as the IPCC models expect? First a very quick summary of the IPCC’s greenhouse theory goes something like this. Increasing CO2 absorbs some of the upwards radiation from the surface, and then re-emits it back toward earth. This has the effect of increasing earth’s atmospheric temperature as outgoing longwave infrared radiation (OLWIR) is reduced by increasing quantities of CO2. Then, recognising that water vapour is the main greenhouse gas, the IPCC models propose that positive feedbacks dominate. This is where some warming leads to increased water vapour, and as water vapour is the main greenhouse gas this increases the greenhouse effect, this further lowers OLWIR, and increases the temperature. So let’s see how the measurements fit the theory. I needed two data sets, one for OLWIR, and the other global temperature. The temperature data I chose is the average of both University of Alabama Huntsville (UAH) and Remote Sensing Systems (RSS). The result is also plotted on the graph below. A linear regression fit shows a generally increasing trend for years 1979 to 2013. And now we’ll take a look at the Stefan-Boltzmann (SB) relative emissivity trend. Using an average global temperature of 14C, the SB relative emissivity has been derived using E/(K*T^4) for each year and plotted on the graph. If the greenhouse effect was increasing, the relative SB should be declining. It’s not. It’s flat lining. The missing heat has gone back to space as it always has – as per SB law, via OLWIR. And more importantly, the greenhouse effect is not increasing as per IPCC dogma.